A Wearable Device for Depression? Suppose we had a wearable device that could monitor your brain waves and display them on your tablet or smartphone the way an EKG machine tracks your heart? Better yet, suppose such a device allowed you to interact with it in a way that made it possible for you to change your brain wave activity? And suppose changing your brain waves helped you reduce stress and anxiety and depression? 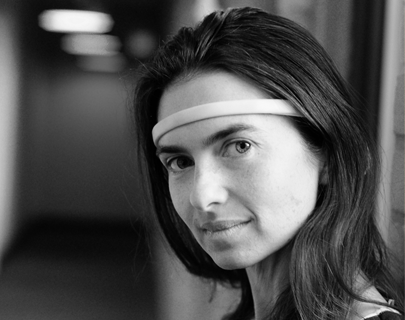 Ariel Garten (pictured above wearing her device) is the co-founder and CEO of the Canadian start-up InteraXon. This year, her company came out with "Muse," an EEG headband that fits around the ears and wraps across the forehead. Various sensors pick up brain waves and send the information via Bluetooth to your tablet or smartphone. At the Exponential Medicine conference I attended last week in San Diego, Ms Garten informed her audience that 70 to 90 percent of doctor visits have to do with stress. Stress, in effect, is at the scene of just about every crime. I have also written extensively on mindfulness as a surefire stress-buster and non-pharmaceutical mood-stabilizer. (See, eg Mindfulness.) Think of mindfulness as the mind watching the mind. With practice, one gradually acquires the skill to spot stress as it happens and take immediate corrective action. This may be as simple as stopping to smell the roses. In other cases, you may be in for a bad day, but maybe you deal with it better. Now - suppose you had a tool that could help you improve your mindfulness? In effect, enhance your mind's ability to watch the mind. To know thyself, and in the process better cope with whatever life happens to throw your way. As your brain changes, the weather in this environment will change in real time. Your goal is to calm and settle the winds in this environment by calming and settling your mind. The demo goes on to explain that every time your regain focus and settle the winds, you build the brain's ability to calm itself. InteraXon claims the benefits of this exercise and others kick in in about three minutes, though the recommendation is a 10-20 minute daily routine. At the Exponential Medicine Conference, Ms Gartner related to me that as a former practicing psychotherapist, she had trouble getting her patients to practice various mindfulness and meditation exercises on their own. In this context, a wearable device - this one costing $300 - can be a potential game-changer. Mindfulness enhancement is hardly a new phenomenon. Bio-feedback technology has been around since the 1970s. So have various forms of brain-training exercises. But now we are seeing the convergence of numerous technologies that will make all this practical and commonplace. InteraXon's Muse is just a small part of this trend, and - who knows? - maybe just a very small part. By all means, exercise your native skepticism. But also be encouraged. Do your own research. Tell us what you think.